Realspace SOHO Vertical Mobile File Cabinet, 2 Drawers, 26 1/2''H x 14 1/4''W x 18''D, Pearl White Item # 941321 by Realspace at Momiji Studios. MPN: 941321. Hurry! Limited time offer. Offer valid only while supplies last. With its space-saving design and easy-roll casters, the Realspace SOHO letter-size mobile file cabinet makes organization and file security simple. With its space-saving design and easy-roll casters, the Realspace SOHO letter-size mobile file cabinet makes organization and file security simple. Its multiple convenient features make this wheeled filing cabinet perfect for your office. White filing cabinet features a drawer body constructed of galvanized steel with a baked-enamel finish for durability. | Embossed drawer fronts and chrome-plated handles add a stylish look. Easy-roll casters let you move the Realspace SOHO file cabinet. | Drawer-glide suspension system ensures smooth opening and closing. 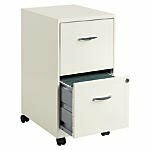 | 2 file drawers provide storage for your paperwork. High drawer sides accommodate letter-size hanging files. No need for hangrails. | 36 lb weight capacity per drawer. The Realspace letter-size file cabinet features 2 drawers that can be locked to protect your files. A vertical support rail engages each cam lock to ensure greater security. Meets and/or exceeds ANSI/BIFMA performance standards. | Assembly required. | Greener choice - contains 30% postconsumer recycled content.